Hiring Success is a comprehensive guide for using staffing assessments to hire the best employees. 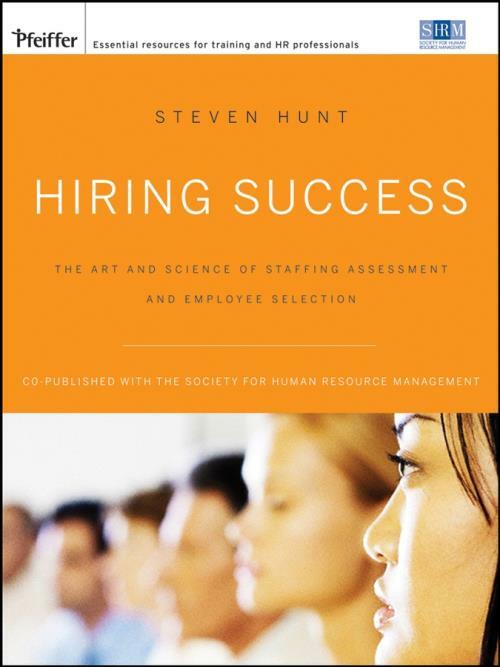 Research–based, but written in easy–to–understand terms, the book explains what staffing assessments are, why they work, and how to use them.Hiring Success is an important resource for improving the accuracy and efficiency of hiring selection decisions and effectively incorporating assessments into any company′s staffing process. "Hiring Success will prove to be a useful handbook and reference guide to HR professionals seeking to better understand and utilize employee selection and assessment tools." "Dr. Hunt′s book is the perfect combination of decision science and management practice. If you are interested in successful hires you must read this book." "Dr. Hunt clearly illustrates the critical contribution of improved employee selection methods to the achievement of strategic business goals." "It is simply a useful toolkit filled with helpful suggestions. . . it will make the process a lot smoother in the long–run!" "A book that is both accessible and scientifically rigorous, an excellent resource for both students and practitioners of HR." "Strikes a superb and much needed balance between the complexities of assessments and the practical application and effectiveness they offer as a selection tool." "Hiring Success is a must read for anyone interested in creating a hiring process that is both sound and maximally effective. An excellent reference for using assessments to achieve measurable business results." Charles Handler, Ph.D. PHR, president, Rocket–Hire Inc.
"Full of useful nuggets, this book helps guide businesses of all kinds. . . . Ensures what you measure aligns with your business objectives and culture." Vito Romano, director of employee development, Costco Inc.